Don’t you appreciate the security that having enough money offers you? What would you have spent it on in the past anyway? Why do you regret having a nest egg? Don’t get me wrong. I do understand the sentiment of an older person telling someone younger to live life in the present, because you never know what’s going to happen and you only live once, but that’s not what she was telling me. While it’s never good to be a hoarder of money or to worry about it obsessively, no one really knows what life is going to bring, which is exactly why you should save up money for when you’re older. 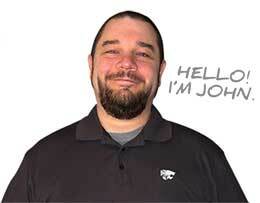 Financial security is a big deal to me. I really don’t like living from paycheck to paycheck or worrying about any kind of debt. It makes me uneasy. Saving my money provides me a huge sense of security, and it’s what enabled me to quit my job in corporate finance a year and a half ago. The thought of trading that sense of security so that I can spend money now makes me panic inside. I definitely want security for myself in old age as well, so I’m definitely not trading that in for a new car today. I’m not one of those people who loves to work so much that I want to do it until the day I die. I’m sure there are people like that out there, but I’m definitely not one of them, and I’m absolutely okay with that. I do want to be able to enjoy my hobbies when I’m older (writing, sewing, and who knows what else by then), and the thought of working when I’m older does not appeal to me. I’m also not entirely sure that social security is going to be available to me when I’m in my 70s, and I’m definitely not going to take a chance on it. I want to retire early enough that I have enough time to enjoy it, and if I do eventually have grandchildren of my own one day, I want to be able to spoil them and help them out with college. At this point, I’m thrilled with how my life has gone so far, and I couldn’t be happier. I know that nothing I could buy right now — a new house, a shiny red car, or some fancy jewelry — will make me any happier than I already am. The things that make me happy right now are things money can’t buy, like splashing in rain puddles and baking cookies with my preschooler. 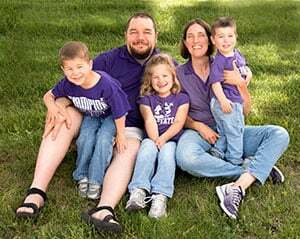 They are simple and true moments, and I get to enjoy them a lot more because I’m not saddled with debt and working multiple jobs to pay it off. Saving my money is what allowed me to leave my conventional job to spend more time with my daughter, and these extra moments with her are worth more than anything money could buy. 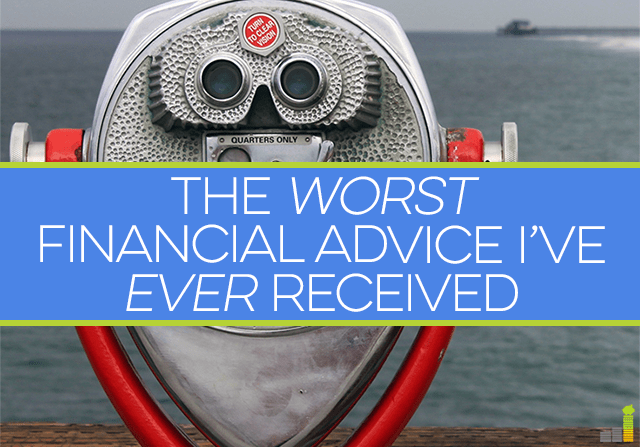 What’s the worst financial advice you’ve ever received? Why do you choose to save money over spending it in the present? What simple things do you treasure? While I can see where she is coming from, I definitely agree with you that the security of having savings and not spending everything now is a better thing to shoot for. I save more now because I want the option in the future to stop working to spend time with my family, travel, and just enjoy life! Sure, I could do some of those things now but it would only mean I would be enslaved to employment for longer in my life, whether it is where I want to be or not. Those are great goals to have! It’s always a good idea to save for your own personal goals and not worry about what anyone else says. I have to admit, there is something appealing about enjoying it all now rather than later and that I’ve had those thoughts before, but I agree that I think I would go crazy without financial security as I get older. While we are primarily trying to save, I treasure moments when we spend a few bucks for ice cream with the kids at the beach, mainly because they’ll grow up with happy memories. I personally would panic if I spent it all now and had nothing to fall back on. I like the feeling of security that it gives me, even if I don’t end up spending it all when I’m retired. That’s ok! My daughter can have it when I’m gone. And spending a few bucks on ice cream with your kids is well worth the experience. I would never give that up just to save a few more bucks. I was once told to finance as much as you can while you’re young. I think the theory was to keep cash for investing but I literally financed everything from furniture to a vacuum. Don’t take all advice literally! Wow, that is terrible advice! I understand the mindset that you can have more enjoyable “experiences” when you’re young, but it’s shortsighted and misses the point about financial security. Sounds like that lady was more focused on the things money can buy rather than the comfort money can bring you. There’s a lot of bad advice out there, all around. I like to read the personal finance articles Fidelity sources from the mainstream sites just to get a laugh. I thought it was terrible, too. The difference is that she already knows what life had in store for her, but I don’t, and I want to be as financially prepared as I can be. I have received all kinds of bad financial advice throughout the years. A few months ago, our accountant even told us we were saving too much for retirement for our age. “If you need to get it out, it’s hard,” he said. “You only need to put in around 10 percent.” WHAT? Wow. At least he’s just your accountant and not your financial consultant. I’d love to know what you told him when he said that. That’s definitely some bad advice. Even if you don’t want or need to spend the money “when you’re older” it’d still be good to have for the security. And, if she didn’t want to spend it on herself, then she could use it for charitable efforts. If only there were personal finance sites like Frugal Rules around when she was younger! She’d probably think differently. I would expect that mindset from younger people but not an elderly lady. Like you, spending more would necessarily make me happier. Sure, you shouldn’t be a tightwad or cheapskate but live a enjoyable and frugal life is possible. Wow, I agree that that’s terrible advice. We are working hard to pay off debt and build up a nest egg because financial security is important to us. That being said, we still like to spend our money on fun things on occasion. I don’t want to end up like Scrooge, hoarding money with no happy memories and no family to spend it with. Spending it on memories is a-okay in my mind. It is good to treat your family to experiences that make memories. I definitely think there’s a fine line between YOLO and saving for the future. You need to enjoy some of your money now, but you need to be prepared for whatever life throws at you in the future too. It’s definitely a balance, but I’m sure not going to blow it all. I’m not a fan of a “YOLO” thing. 🙂 For me, I would totally save because I have a kid and I want to give her a best life especially for her future. Yes, and not only that but our kids are watching how we spend our money and learning from it. It’s good to be frugal! I’ve had someone say this to me as well and it will be in my mind forever. It’s such bad advice and I can’t believe some actually believe it. I know, I kind of wish I could forget about it. While I certainly appreciate the fact that you should find time to enjoy your life while you’re working hard, I can hardly say I’m comfortable with the idea of spending all of my money now since I won’t want to when I’m older. There’s something to be said about finding a happy medium in saving and spending. For goodness sake, DO NOT spend all of your money now. You’ll need it when you retire!!!!! Yes, you shouldn’t scrimp so much that you hate life, but you shouldn’t blow it all either. It’s a balancing act. I wonder if she regrets not enjoying life when she was younger? The worst advice we got was to invest in a Ponzi scheme. Didn’t do it, but wasn’t thrilled with the “advice” from family. Yikes! A ponzi scheme! That’s terrible advice. The worst advice I received is that I didnt have to build an emergency fund as emergencies won’t happen to me, and if they do, I’ll make it through with the cash in the bank or by relying on unused credit cards. I am glad that I didn’t follow this as I have had some emergencies and the emergency fund truly helped me pay those medical expenses. Now, I am still saving for my emergency fund. I figure you’re lucky if you don’t have any emergencies ever, and you should be prepared for them because you just never know. It’s not worth the risk! Like you, I’m always open for listening to advice, but always consider the source. I always feel like saying, “What qualifies you to give me advice on anything, let alone finances. Let me see your personal balance sheet, then we’ll talk.” But, obviously, I never do. For some reason, people feel the need to tell others what to do, often unprovoked. And, the worst part is, they have nothing to substantiate their perspective! I definitely agree that there is nothing that I could buy now that would make me really sustained kind of happy. it’s nice knowing I have the freedom to do that, but I’d rather watch my savings grow and my countdown to ER get closer. That advice sounds as if it came from someone who wasn’t particularly able or vital in their ‘senior years.’ I can sort of understand the attitude–things hadn’t worked out as the person hoped and perhaps expected. But until we can reliably forecast the future, we have to do the best we can with planning. Like you, I don’t need to spend a ton of money today to have fun and have a great quality of life. And the thought of finding myself age 70+ with only crummy living options and in fear of running out of money totally before I die scares me into focusing on saving plenty today. 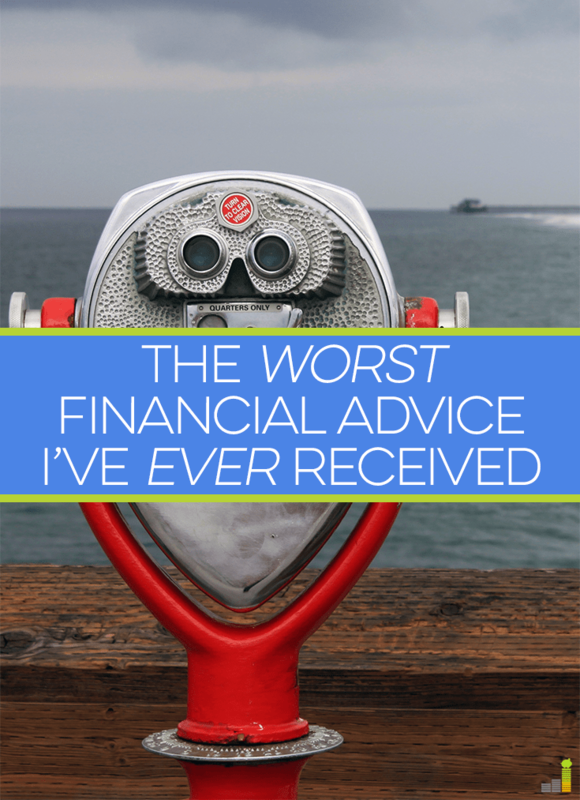 The worst financial advice I have heard, and continue to take notice of on a regular basis is what I “should” do. Everyone is different and so are their circumstances yet it seems OK these days to be told I “should” have life insurance, I “should” retire early, I “should” be a millionaire by 30, I “should” not use a credit card ever, I “should” max out this and that…and so on. If I see the word “should” in any blog title or PF paper of any kind I stop reading and remember it is my life, my financial circumstances and I have managed to be out of debt for years, am about to take a 3 month trip on money, am looking to buy property with cash I have saved and am in an excellent financial position based not what I “should” do but what I can do given my unique circumstances. Thanks for this. I recently told my Dad to spend all his money ( he is worried about not leaving any for his kids) because he did save it when he was young and now he wants to use some to enjoy is senior life. As they say “you can’t take it with you”.